Egg roll is one of the most popular street foods from Bengal. 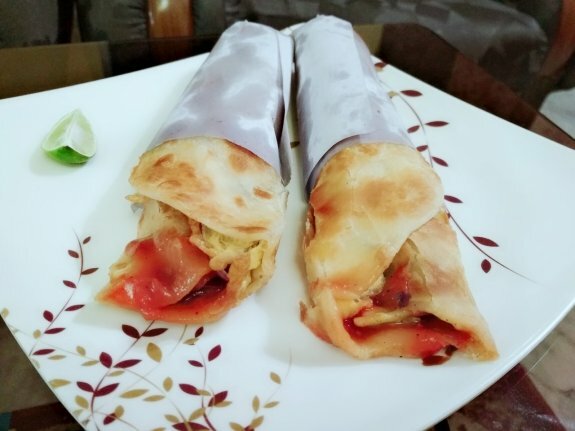 This is a tasty and veggies filling egg paratha roll that will definitely give you a wonderful taste in your mouth. So, try this popular Kolkata Street food recipe at home. 1. Take a bowl and mix all purpose flour and salt and mix everything well. 2. Now add 1 Tbsp oil and mix until the texture of the flour become sandy. 3. Now knead the flour using water and make soft dough. 4. Cover the dough with wet cloth and keep it aside for 30 minutes. 5. Take a bowl and beat 1 egg with little salt like the omelette batter. 6. Now, take the dough and knead it again. Divide it into 2 parts and make round ball of each portion of dough. 7. Take one dough and roll out it into a circle to give it the 6” diameter paratha shape. 8. Now, heat 1 Tbsp oil in a flat frying pan and then pour Egg mixture over the oil. 9. Now, place the paratha over the semi cooked egg and using spatula press it and cook it for 1 more minute in low flame. 10. Turn the paratha and cook other side for around 2 minutes till the paratha fully cooked and crispy. 11. Now, remove the egg stack paratha from the pan and place it in a plate and put cucumber,onion and green chili mixture horizontally in one side of the paratha. Now, sprinkle some tomato sauce, green chilli sauce and lemon over it. 12. Roll the Egg Paratha stuffed with veggies from one side and wrap it using a paper towel and twist the paper towel to close it. 13. Do the same process for the rest of the egg rolls.